Bringing together national efforts into a common and aligned European approach to develop a world-class digital construction sector. Europe’s public procurers, policy makers and public estate owners recognize the positive and transformative effect that digitalization brings to both public works and the construction sector. The Task Group’s vision is to encourage the common use of BIM, as ‘digital construction’, in public works with the common aim of improving value for public money, quality of the public estate and for the sustainable competitiveness of industry. 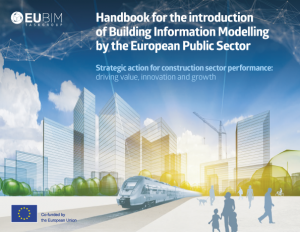 The European Commission recently awarded the EU BIM Task Group funding for two years (2016-2017) to deliver a common European network aimed at aligning the use of Building Information Modelling in public works. The group will be communicating its ambition at conferences around Europe and holding a launch event in Brussels to grow its public sector membership and engage with industry. The focus of the group is to develop a handbook containing the common principles for public procurers and policy makers to consider when introducing BIM to their public works or strategies. The handbook will include procurement measures, technical considerations, cultural and skills development; and the benefits case for BIM and ‘going digital’ for policy makers and public clients. The social, environmental and economic benefits of digitalization are well recognized: Building Information Modelling (BIM) is digitalization for the construction sector. From a public stakeholder perspective, BIM can provide significant efficiency benefits to public works, to public value for money and be a driver for growth and competitiveness. How is the group organised and funded? The group has a chairman, a steering committee and a general assembly that acts as an advisory group to the steering committee. The group is co-funded as a project by the European Commission under a call for funding, the remaining co-funding is comprised of in-kind contributions from the participating member states. The lead coordinator for the project is the UK Government’s Department for Business, Innovation & Skills (BIS) – however this is very much a pan-European team effort. Why are these European member states collaborating? As public sector representatives, we don’t compete with each other. By sharing best practices we can go faster with our own transformation programmes and show united leadership to industry. Acting together will help us to grow a more productive and competitive European construction sector that is digital, world-class, open and fair. Ultimately, this will enable us to take better care of our public buildings and infrastructure and generate greater economic value. Does this group compete with buildingSmart? No, the EU BIM Task Group represents the public stakeholder interests relating to BIM and public estate to national and international standards bodies, such as ISO, CEN and buildingSmart. The EU BIM Task Group will not be creating new or competing standards, it will develop common guidance and practices for public procurers when introducing BIM.